I met her just once in person. I felt embarrassed after asking about her arm in a sling when she told me why it was. But she instantly put me at ease and we went on to have a nice chat. Ladies: Please see your doctor regularly. We need you. This entry was posted in health, mothers on February 7, 2012 by KB. I had the fortune of being interviewed & quoted for this story Mashable.com story, “7 Tips for Marketing to Moms” where I talk about a Hallmark television ad, Tinyprints marketing campaign, mom stereotypes, Facebook, Klout, and social media influence. This entry was posted in business, marketing, mothers on January 2, 2012 by KB. I have this tendency towards not conforming to what everyone else is doing. It’s not that I think I know better, it’s just that I get interested in the road less travelled. This notion is a factor in my career where most of the people I interact with are women. I’m the gender-minority it most situations, and it feels right for me. That’s not to say I don’t like hanging with guys, but women are more interesting. This gender imbalance is showing up for others in social media today. Women dominate. 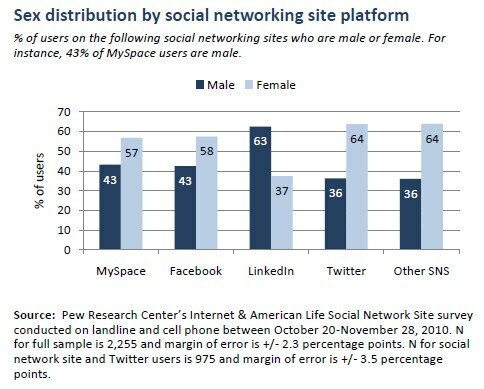 Twitter is the biggest surprise as seen in the chart, where 64% are women, and only 36% male. Yup you guessed it, I’m on Twitter regularly. And even though I have a LinkedIn account, I rarely visit. More interesting information in Social networking sites and our lives from The Pew Research Center’s Internet & American Life Project. This entry was posted in mothers, technology, work and tagged gender, pew, social media, social networks on June 17, 2011 by KB. Did some work for American Bronzing recently. This entry was posted in business, marketing, mothers on March 9, 2011 by KB. Presented, Sampling, the Hot Targeting Tactic, to the attendees at the 2011 INDA Vision Consumer Products Conference. This entry was posted in marketing, mothers and tagged product experiences, sampling on January 12, 2011 by KB. This entry was posted in business, marketing, mothers on November 22, 2010 by KB. Defining boundaries and setting expectations are important in any relationship. When asking for a user’s email address, be crystal clear with the email opt-in language. Ambiguity here can crush involvement and ongoing attention, while increasing the rate in which people opt out of future communications. If you can give her the ability to pick and control of the types of the messages she receives, all the messages will be all that more relevant and, thus, both parties benefit. This entry was posted in business, marketing, mothers on October 29, 2010 by KB. Some businesses appear to take shortcuts in understanding and reaching out to mothers. Here’s a mistake they make. This entry was posted in business, marketing, mothers on September 24, 2010 by KB. 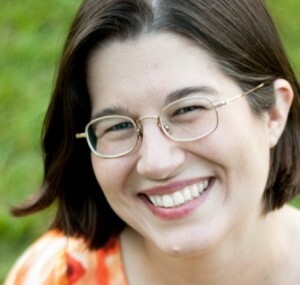 Mom bloggers can provide tremendous value to businesses. Companies covet the audience mom bloggers have acquired because these readers are potential consumers. Mom bloggers have powerful voices and, as a result, often have a big influence on the moms who are reading. Businesses recognize this influence and also know that few things benefit a company more than when a highly respected mom writes positive things about that company’s brand. This entry was posted in business, marketing, mothers on April 30, 2010 by KB.